Why do we need jobs if we can have slaves working for us? This is a post by Nate Hagens and DJ White. Rich in ideas and concepts, it is longer than the average post on Cassandra's Legacy but well worth the effort of reading, savoring each sentence in it. 1. Fossil carbon compounds are incredibly energy dense, as their formation and processing was done by geologic forces over deep time. One barrel of oil contains about 1700 kWh of work potential.Compared to an average human work day where 0.6kWh is generated, one barrel of oil, currently costing under than $50 to global citizens, contains about 10.5 years of human labor equivalence (4.5 years after conversion losses). 2. As such, these ‘fossil slaves’ are thousands of times cheaper than human labor. Applying large amounts of these ‘workers’ to tasks humans used to do manually or with animals has generated a gargantuan invisible labor force subsidizing humanity – building the scale and complexity of our industry, complexity, population, wages, profits, etc. 3. GDP - what nations aspire to - is a measure of finished goods and services generated in an economy. It is strongly correlated with energy use, and given that almost 90% of our primary energy use is fossil fuels, with their combustion. 'Burning stuff' (measuring how much primary energy is consumed) is a reasonable first approximation for GDP globally. 4. Regionally and nationally this relationship can decouple if the ‘heavy lifting’ of industrialization is done elsewhere, and the goods (and embodied energy) imported. (e.g. China). The relationship between global energy use (which is ~87% fossil fuel based) and GDP remains tightly linked. maximize dollar profits, it often makes more sense for corporations to mechanize and hire ‘fossil slaves’ than to hire ‘real workers.’ Real income peaked in the USA around 1970 for the bottom 50% of wage earners. 7. On an ‘empty planet,’ pursuing GDP in order to gainfully employ people (and distribute money so they could buy needs and wants) seemed to make sense. However, on an ecologically full planet pursuing GDP with no other long-term plan is using up precious natural capital stocks just to maintain momentum and provide people brain-pleasing neurotransmitters. 8. There are numerous alternative measures to GDP that incorporate well-being and happiness and subtract environmental ills. But it won’t be easy to switch objectives from GDP to e.g. G.P.I. (Genuine Progress or Happiness) because the present creditors will expect to be paid back in real GDP ($) rather than happiness certificates. Still, over time, strict metrics of success based on consumption alone are likely to change. 9. There will likely be a growing disparity between ‘jobs’ (occupations that provide income and contribute to the global human heat engine) and ‘work’ (those tasks that need to be accomplished by individuals and society to procure and maintain basic needs). However, at 2015 USA wage rates, moving from $20 per barrel (the long-run average cost for oil), to $150 per barrel, the army of energy slaves declines from 22,000 per barrel to under 3,000 – meaning the economy shrinks and therefore much more work needs to be accomplished via efficiency improvements, real humans, or making do with less. 10. Our institutions and financial systems are based on expectations of continued GDP growth perpetually into the future. No serious government or institution entity forecasts the end of growth this century (at least not publicly). Okay. Let’s unpack all of this a bit. Often in the news today, you'll hear people talking about job growth and job creation like it's a good thing. Everybody wants a good job, right? The more jobs we have to do, the better off we are! Yet if you kick open an anthill or a beehive, the insects will not be grateful for the sudden boost in job creation, and they will effectively utilize the cross-species language of biting and stinging to inform you of this opinion. From this we may infer that insects don't understand economics. Alternately, it could it be that ants - having honed their behaviors for 130 million years and having attained a total biomass we have only recently (and temporarily) matched - might be in tune with some deep realities about jobs, energy, and the embodied cost of building complexity. Since this is Reality 101, let’s ask some basic questions. What ARE jobs, really? How do they relate to energy and wealth? How do we keep track of whether we’re richer or poorer? We all kinda feel like we know. And (as a general rule) whenever “we kinda feel that we know” is the case, we should probably take a closer look. To do so, we’ll first need to add a few things to our story about ants. We need to revisit our invisible energy slaves, discover what “freaks out” capuchin monkeys, and think about what wealth actually is. As you recall - and as we’ll discuss in greater detail as the course goes on - every American has over 500 invisible energy slaves working 24/7 for them. That is, the labor equivalent of 500 human workers, 24/7, every day of the year, mostly derived from burning fossil carbon and hydrocarbons. Every American thus has a veritable army of invisible servants, which is why even those below the official poverty line live, for the most part, lives far more comfortable and lavish with respect to energy and stuff than kings and queens of old (but obviously not as high in social status). Being long dead and pulled from the ground - and thus a bit zombie-esque - these energy slaves don’t complain, don’t sleep, and don’t need to be fed. However, as we are increasingly learning, they do inhale, exhale, and leave behind waste. Since they’re invisible, we don’t think about these fossil helpers any more than we think about nitrogen (which happens to be 78% of what we breathe in, but hey, it’s just “there”, so why think about it?) Same with our 500 energy helpers. The extent we think about them is when we fill up at the pump or pay our electric bill – and then only as an outlay of our limited dollars. We use the “slave” metaphor because it’s really a very good one, despite its pejorative label. Energy slaves do exactly the sort of things that human slaves and domestic animals previously did: things that fulfilled their masters’ needs and whims. And they do them faster. And cheaper. Indeed, it probably wasn’t a big coincidence that the world (and the USA) got around to freeing most of its human slaves only once industrialization started offering cheaper fossil-slave replacements. The things we value are created with a combination of human and energy-slave work combined with natural capital (minerals and ores, soils and forests, etc.). There are huge amounts of embedded energy in the creation and operation of something like an iPad and the infrastructure which makes it work. When we tap our screen to view a kittycat picture, the image is pulled from a furiously spinning hard drive which may be halfway around the planet, propelled by some fossil slaves, and routed through data centers which are likewise fueled. The internet uses over a tenth of the world’s electricity - that’s a lot of energy slaves. The infrastructure itself has taken decades to build, and requires constantly increasing energy to maintain. But we don’t think much about that either. So the internet is infrastructure we have invested energy in, just like a built anthill has been invested in with ant labor. If the internet (or an anthill) was destroyed and needed to be rebuilt, that situation would certainly create jobs. But it would also require a lot of energy, raw materials and work. Ants don’t have energy slaves, so they don’t want more work to do. They are dealing with finite energy inputs in their ecosystem. If more energy (ant-labor) is devoted to rebuilding the anthill, less energy is then left to care for the larvae, forage for food, and defend the hive. Energy slaves don’t care either way about job creation. (Being zombies and all). But why do we? Everybody wants a good job. Now in times past, a human’s career, their societal function, was largely about their own individual labor and skills. A blacksmith worked with metal. A cooper made barrels. A shoemaker made shoes. Others made furniture, cloth, or other valuable commodities. Farmers created food. Preachers preached. Others did simpler labor like digging ditches or cutting down trees. The relative value of their labor was roughly set by how much other humans valued the end product of such labor, so a skilled blacksmith might be able to trade his services for more status and better accommodations than a ditch digger. Thus, it became an integral part of human culture that the products of some work were considered more valuable than others. It became a mark of social status and pride to have such a career. Hold that thought too, we’ll be coming right back to it. “Equal Pay for Equal Work” is currently the slogan for those opposed to sexual discrimination, which is usually characterized by women getting paid less than men. And it’s a sentiment which has deep roots in the ape and even simian mind. If you give capuchin monkeys the “job” of doing a nonsense task in exchange for a reward, they will happily do it all day long as long as they keep getting a reward - cucumber slices. But if a capuchin sees the monkey in the next cage get a (better tasting so higher value) grape while it still gets a cucumber slice, it’ll go ape, throwing the cucumber slice in the face of the experimenter in a rage. It gets the same cucumber slice it has been happy to work for before, but it no longer wants it, because it no longer feels fair in comparison to its cage mate’s effort and reward. Instead, it wants the experimenter and the other monkey to be punished for this inequity (we watched this video of Frans de Waals experiment in class). Think for a moment how central this monkey reaction is to the human world around you. We’ll come back to it later in the course, and will refer to the term “capuchin fairness” because a similar mechanism turns out to be behind a great deal of human behavior. We’re outraged at the notion of somebody getting more reward than we do for doing the same thing. Indeed, many large-scale human institutions now stress perceived fairness of process over quality of end results. (A prominent example might be the US Congress). Moreover, this monkey-business also reiterates the concept of relative wealth being more important to a monkey mind (and a human mind, it turns out) than absolute wealth, which is kind of nuts, but that’s monkeys for you. Ok. Ants. Monkeys. Energy Slaves. So where did “jobs” come from? 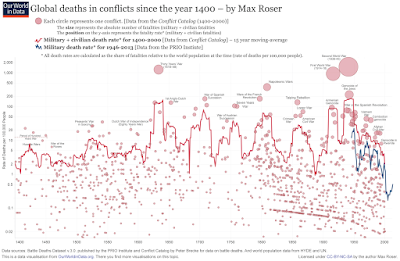 A funny thing happened on the way to the Anthropocene. To an ever-increasing degree over the last two centuries, wealth has been created more by fossil slaves than by human labor, significantly more - and it’s at its all-time peak about now. (you’ll have the information to derive this yourself by the end of this course). If you don’t believe that, try hiring a bunch of people to push you and your SUV around hundreds of miles per week with their own muscles and see what it costs you, and then see how little it costs you to buy the same work in a tank of gasoline. In fact, the vast majority of the tasks and stuff that used to be done by human labor is now done by fossil slaves and the infrastructure they have enabled. The slaves have also made shipping nearly free, so any actual human labor we need can also be hired in the cheapest places on earth (under essentially slave labor conditions), and shipped to us by planes, trains, ships and trucks for next to nothing. So rather than buying furniture from local artisans, we make local firms compete with furniture made halfway across the world which is cheaply shipped to a local store. 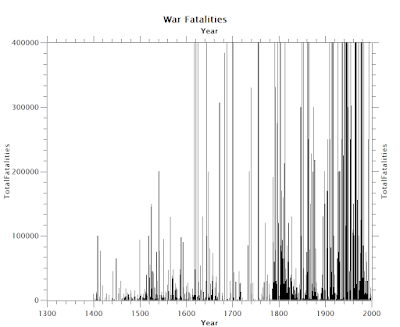 To a good first approximation, the USA doesn’t make anything anymore (well, movies…). We have amassed a huge amount of wealth, even if much of it is dumb stuff like plastic toys and salad shooters and things that quickly break. There are so many things we think we want, so we get them. We eat salads with fresh veggies which may be grown 5000 miles away and air-flown to our stores by energy slaves running the planes, refrigerators, trucks, and stores. The average dinner travels over 1400 miles to get to your plate in USA. We increasingly buy disposable everything - used once and tossed away. Most everything is short-life these days; when your authors were young if you bought a fan, you expected it to last 20+ years. Now if it lasts 2-3 before you toss it, that’s about par for the course. Planned obsolescence exists because it’s “good for GDP.” A new dishwasher now lasts 6-8 years when it used to last 12-16, because they now have integrated cheaper electronics that fail. Our GDP has become tethered to rapid product-replacement cycles keyed to our short attention spans and our enjoyment at buying new things. This creates “jobs” for car salesmen, advertising executives, etc., but has tilted the scales in favor of “useless GDP” rather than real societal utility. We know how to make things with high quality that last, but due to time bias and the financialization of the human experience, such an objective is relatively unimportant in our current culture. Many people get a new phone every 18 months with their cell plan, and perfectly functional ones wind up in the landfills. But how should we distribute the largesse of the energy slaves? Does everyone get equal shares? Do we take the total number of dollars (which is the way we count such things) created by energy-slave work and divide them equally among the population? Heavens no. We haven’t even acknowledged that the energy slaves are responsible. Rather, with a bit of help from opportunism, social evolution co-opted the pre-existing “work for pay” concept into an uneven distribution system that “felt” fair. These days there are a lot of jobs in the USA, which keep us very busy not making much of anything of long term value. We do advertising, hairstyling, consulting, writing, and a lot of supervising of the things our fossil slaves do. We don’t care all that much what we’re doing as long as we feel we’re getting paid at least as well for the same task as the other capuchins – er... people - around us, and that with our compensation we can buy things that give us pleasing brain-reward experiences. These days in this culture, a “good job” is defined by how much it pays, not by what it accomplishes. Many people would consider it an optimum situation, a great job, to sit in a room for 40 hours per week and make $100,000 per year, just pulling a lever the way a capuchin does for a cucumber slice. You know they would (would you? Think about it. Now think about how that compares to the career you’re currently planning). And that’s where the perceived equality is: the equality of inconvenience. The 40-hour work week is a social threshold of inconvenience endured, which is now what we keep primary social track of rather than the productive output of a person’s activity. In 1930 John Maynard Keynes predicted that wealth would increase 600% in the next century (which is only 15 years away) and because of this wealth, people would only need to work 15 hours per week. He was right about our wealth increase, but paradoxically, we are working longer hours than ever! Because socially, everyone who isn’t a criminal is supposed to have a job and endure roughly equivalent inconvenience. Any segment of society which went to a 15-hour work week would be treated as mooching freeloaders, and be pelted by cucumber slices and worse. In a society in which we’re all basically idle royalty being catered to by fossil slaves, why do we place such a value on “jobs”? Well, partly because it’s how the allocation mechanism evolved, but there also exists considerable resentment against those who don’t work. Think of the vitriol with which people talk about “freeloaders” on society who don’t work a 40-hour week and who take food stamps. The fact is, that most of us are freeloaders when it comes down to it, but if we endure 40 hours of inconvenience per week, we meet the social criteria of having earned our banana pellets even if what we’re doing is stupid and useless, and realized to be stupid and useless. Indeed, a job that’s stupid and useless but pays a lot is highly prized. So “jobs” per se aren’t intrinsically useful at all, which is why ants don’t want more of them. They’re mostly a co-opted, socially-evolved mechanism for wealth distribution and are very little about societal wealth creation. And they function to keep us busy and distract us from huge wealth disparity. We’re too busy making sure our co-workers don’t get grapes to do something as radical as call out and lynch the bankers. Keeping a population distracted may well be necessary to hold a modern nation together. And since most of our wealth comes from invisible, mute slaves we don’t even think about, it isn’t clear to us that what we’re actually doing in current economies is distributing the wealth they create. That means we can now have wild disparities in pay, as long as it “feels like” others are doing something qualitatively different. The amount paid to a wall street vice president is hugely greater than that paid to a college professor, which in turn is greater than that paid to an environmental campaigner. This has pretty much nothing to do with the relative worth of each function to society, and everything to do with how well-connected such jobs are to the flow of energy-slave-created wealth. Yet if higher pay is received by someone in another “tribe” who we don’t directly interact with, we don’t feel the urge to scream and throw our paycheck. We just wish we had a “better” job. If we reflect on the possibility that we have en-masse simply accepted the premise that the job is somehow paid what it’s worth, we arrive at some disturbing conclusions. Is a teacher, farmer, or fireman really of less value to society than a real-estate flipper? The amounts paid for jobs have been allowed to float freely, detached from actual societal value as the degree of political connectedness of those with such jobs varies. The vast majority of our wealth comes from primary natural capital in tandem with fossil slaves and from the fruit of empire; jobs are mostly an ad-hoc mechanism for distributing this wealth unequally in a way which effectively conveys the illusion of egalitarian process. For now, are most of us just idle princes and princesses in a fossil-slave kingdom, none of us really at huge risk, and mostly doing things which have little net value? And what happens when our fossil slaves grow wings and fly away into the atmosphere? What will the princes and princesses do then? This leads us to the story of how we keep track of our wealth and productivity and success. How DO we keep track of that collective wealth anyways? Well for real wealth, mostly we don’t. The value of a healthy ecosystem, clean air, seas full of fish, fresh drinkable water… love, joy, happiness and fulfillment… all these things our market system considers to be of essentially zero value. Armadillos, dolphins, hummingbirds, rainforests… you get the idea. But our economists have a metric called “gross domestic product” GDP which is what our society uses to roughly keep track of our ‘success’. It represents the dollar value of all finished goods and services produced in a time period (typically, a year) within a nation’s borders. Since that other stuff- you know, the natural world- doesn’t consist of finished goods and services, it isn’t counted (now if you kill the hummingbirds and make them into ornaments for hats, or turn armadillos into ashtrays, they then can be added to GDP because they’re now products which are “finished”!). The fact that parts of the environment which have been “finished” are considered more valuable than parts which are “unfinished” is one way in which GDP sets a fairly screwy default value in our current world. It’s a tacit societal value system: anything without a transacted money value isn’t part of GDP. So a nation which chops down all its trees to sell to another country for firewood has a better GDP than one which leaves its trees standing. It’s a funny way to figure wealth, but it’s what we’ve got. And oh, by the way, we’re betting everything on it. GDP is based on money transaction (money is, roughly speaking, a claim on future energy), and since most current wealth is created by our fossil energy slaves, GDP is directly tied to the energy burned by society. Indeed, it has recently been shown that GDP is tied to fossil fuel energy, and thus CO2, in a way which may be described very simply by treating human society as essentially a giant heat engine. In other words, a very simple model which treats human civilization as an essentially mindless consumptive system - a thermodynamic amoeba in search of energy - suffices to match the GDP with the quantity of energy burned. 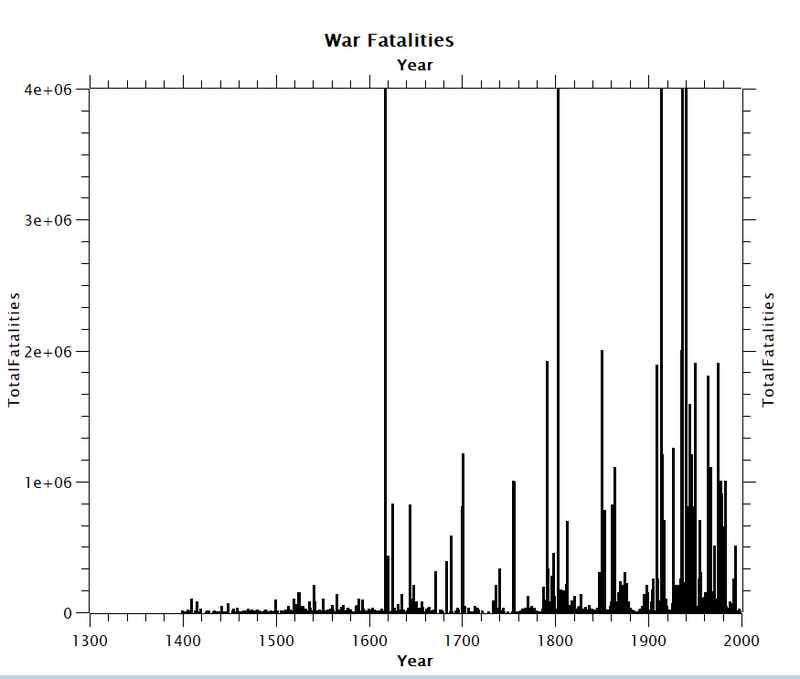 And over the last 100 years, our burning of energy, and thus our world GDP, has gone through the roof. 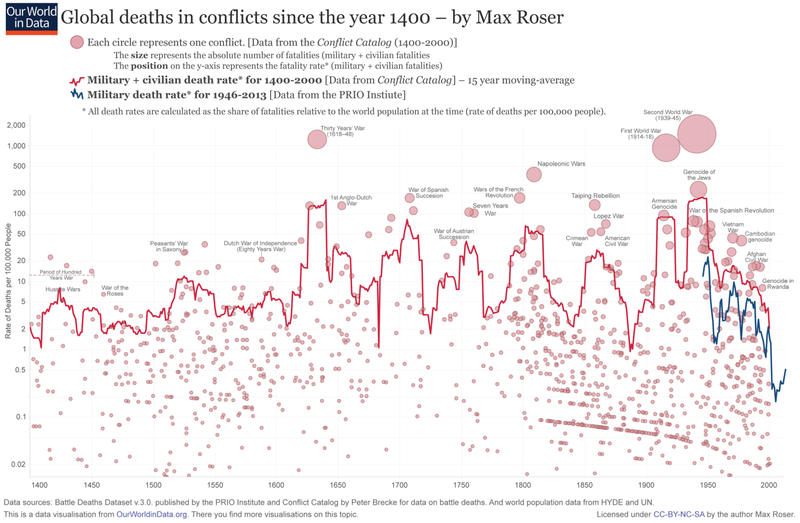 The number of dollars representing the wealth created from the burning has also increased, and exponentially so in the last 50 years, and since the 2008 crisis, even faster. 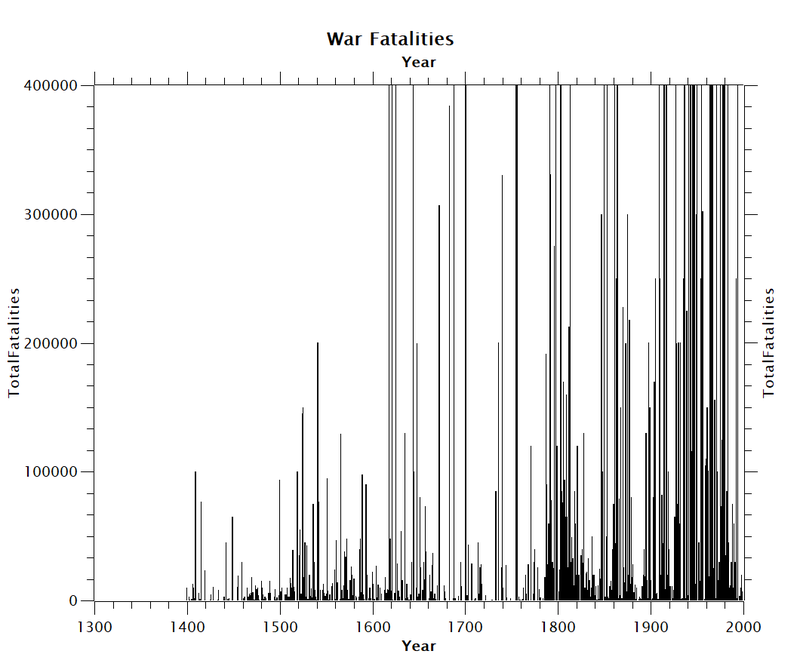 It may be reasonable to reflect that during this same period, sometimes called The Great Acceleration, the planet has been largely laid to waste, a mass extinction has accelerated, the seas have been depopulated of most fish, and the systems which sustain large complex life on earth have been progressively compromised. Yet we continue to grow the scale of the heat engine to accomplish the primary objective of the modern human economy: to maximize dollars and jobs. Bear in mind that what we’re doing - if we get right down to it - is converting trillions of watts of fossil-slave energy into a few watts of pleasing stimulation inside our brains. (alternately: tiny amounts of brain-reward chemicals) And the side-effect of this process is all around us. Mountains of waste, acidified oceans, altered climates, pollution, mass extinctions, and mischief. Here we use “mischief” as the general term for things humans do en-route to pleasing themselves, which may include building racetracks, using disposable diapers, making wastebaskets out of elephant feet, overbuilding fishing fleets, throwing out our electronics every two years to replace them with new ones, etc. It doesn’t “feel like” waste at the time. But if you ask someone in 200 years what percent of fossil magic was wasted, they will likely say “all of it,” because not much useful fossil fuel (or anything previously built with it) will likely remain. The ubiquity of fossil slavery during our lifetimes has caused us to conflate wants and needs. Most of what we “feel like” we need these days is nothing we evolved to need. Consumerism is driven largely by social competitiveness. Most capuchins – er…, people - find it more important to have a bigger house than their neighbors, than to have an even bigger house in a neighborhood where it’s the smallest one. Relative wealth - it’s not just for monkeys (we and the monkeys like fairness, but it feels more fair if we’ve got stuff at least as good as the people we interact with). And this signaling of status is important socially and sexually. A lot of the things we feel we need are just for show. And do you remember the “hedonic ratchet” effect from earlier discussions on bias, heuristics, fallacies and delusion? To get the same mental stimulation we got yesterday, we require the expectations of ever-increasing reward. That means more money and more energy slaves. Or at least the expectation of same. Happiness is not correlated with wealth beyond having the basics of life covered. Most of the things which actually make us happy, joyful, and fulfilled are in our virtual mental worlds, and not in the physical world at all. A Filipino may have only a small percent of the number of energy slaves as an American, but be every bit as happy, and surveys have shown that to be true.57 It’s quite possible to be “poor” and happy. Equally, it’s quite possible to be rich and miserable. Our brains are even primed for it, seemingly. Well, you already know that our amoeba-like heat-engine of an economy is wrecking the earth, acidifying the seas, melting the polar caps, causing what could become the greatest mass extinction in 65 million years, and throwing our future into doubt. But at least we have our good ol’ energy slaves to continue creating GDP. Right? Thing is, the energy slaves will soon be going away forever. In the last 30 years we’ve burned a third of all fossil energy that has been used since it was discovered thousands of years ago. Since your authors have been alive, humans have used more energy than in the entire 200,000 year history of homo sapiens. We are just now passing through the all-time peak of liquid hydrocarbon availability, which is the chief driver of our economies due to its special attributes. Each year, basically from now on, most of us will have fewer fossil energy slaves marching behind us. You’d think this wouldn’t make much difference, right? Since they’re invisible anyhow? But in fact it’ll make a great deal of difference, because we’re heading back into times – either gradually or suddenly, but inexorably - in which human labor makes up an increasing percentage of the total energy we have available. One day human (and perhaps animal) labor will again be the majority of the work done in human societies – just like it is in an anthill. And this will happen in the context of a more used-up natural world. Rather than being able to catch dinner by throwing a hook in the nearby ocean, the nearest healthy schools of fish may be ten thousand miles away in Antarctica, and hard to get to without dirt-cheap energy slaves to make giant refrigerated ships to pursue and move them around for us. The copper mines will be mostly used up. The inorganic phosphate deposits we used to make fertilizer, mostly gone. And so on. Or rather than “gone,” let’s use the more accurate term energetically remote. That is, there will still be loads of “stuff” underground, but it won’t be the very pure ores of yesteryear. It’ll be stuff that requires digging up a huge amount of rock for a tiny amount of whatever we’re after. Because (remember the Easter candy story) we always use the best stuff first. Yet we’ll be going after worse and worse ore with fewer and fewer slaves. And the heavy breathing of the fossil slaves will have pulled our seas and climate back towards conditions in which they were born - a hellish primordial world of toxicity. This all raises the question - or at least should - of whether it might not be a good idea to set the fossil slaves free and let them rest, since they’re going away soon anyhow and when they do we will really need a livable planet. They don’t need jobs, and we don’t need dollars for happiness. Yet this flies in the face of capuchin entitlement and evolved mechanisms for brain reward, which – in effect - take our current societal arrangements for granted. As our fossil slaves eventually retire – childless –we might have to rediscover the difference between jobs and work, just like the ants. So other than using up non-renewable resources and degrading the natural world, what other consequences can there be when maximizing GDP is our plan for the future? Well, for one thing, it can lead us to really screwy societal choices. For instance in the infamous Easter island culture, there was an organizing belief in belief that all food, resources, and other good things came from their dead ancestors, and that the way to make your dead ancestors happy was to build giant statues for them. This was actually not that different an organizing concept from GDP, in that both exhibit a near-hallucinatory level of disconnect from physical reality and ecology. As ecological changes on Easter island worsened due to rats cutting into food supplies, it “made sense” to vastly ramp up the production of giant stone statues, making them ever-bigger (and hence presumably more pleasing to the dead ancestors... “too big to fail”, perhaps...). This was a colossal undertaking for a stone-age people using human muscle power, and required a lot of wood for rollers and leverage. So they cut the trees down, which caused erosion to begin washing away their productive farmland. The worse things got, the harder they worked making stone giants. The final generation of stone giants never left the quarries - they were too big to move. As a part of this process, eventually the last large tree was cut down, which made sense based on their organizing beliefs, but was in retrospect not a good plan. It not only meant their fertile soil washed away, but meant they could no longer make boats to go fishing. 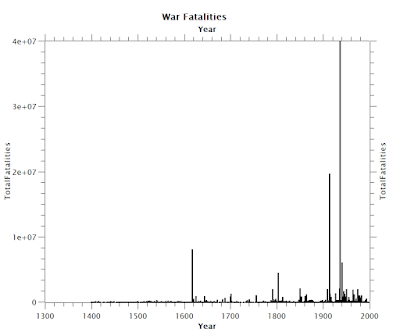 So they starved, fought, and suffered a lot as their populations crashed. Today it’s easy to joke about these islanders and their “giant stone heads” as a high point in the history of human doofus-ness. Yet our adherence to GDP is a similarly skewed metric, equally detached from the realities of ecology, from human happiness, and from the potential for future generations with decent life quality. On a much larger scale, we too are eroding farm land (which these days is largely a dead medium used to hold the seeds in place and receive industrially-produced fertilizer and pesticides), destroying the ability to get fish (by wiping out fisheries), and, because of our numbers, mucking things up to a degree the Easter Islanders never reached. We’ve already mentioned that - due to being blind to the energy slaves who do nearly everything for us - we now tend to conflate “jobs” with “work”, where “jobs” are just a social distribution mechanism for energy-slave largesse - an entitlement entwined with social status - and “work” is what is necessary to temporarily improves an individual, tribe, nation, or species’ circumstances. We’ve also noted that we have folded “planned obsolescence” into most built consumer devices, so they break more quickly and require replacement, tuning their life-cycle to human whims and brain rewards rather than to real utility. Mostly we don’t really even want or expect gadgets to last as long as they used to; as long as we can afford it, we want the newer, cooler, stuff. And advertising helps keep our culture primed for it. The fact is, we have designed a social system that requires growth. Money –really a claim on future energy and resources – comes into existence irrespective of whether such future energy and resources will be available. Each year we need growth in a household/city/state/nation/world to service and pay off monetary loans that were created previously. No serious government or institutional body has plans for anything other than continued growth into the future. Growth requires resource access and affordability but starts first with population. Paradoxically, as traditional drivers of GDP growth – development of virgin land, credit expansion, low cost fossil fuels, and groundbreaking innovation- wane in their impact, there may be renewed incentives proposed not to shrink our population as ecology would advise, but instead to grow it! Currently we are having (as a species) over 120 million babies per year. This works out to over 335,000 human babies born every day – compared to a total extant population of all the other Great Apes (bonobos, chimpanzees and gorillas) of about ~200,000! Since ‘demand” is considered a quasi-magical force in current economic theory, babies are considered to be good for business (yet children brought into the world now for GDP reasons will face some real challenges in their lives. Nate and DJ decided not to do that for a host of reasons). China is building massive empty cities now. No kidding. Cities with nobody in them, ready to be moved into by the bonus babies to grow GDP. That’s edging perilously close to building giant stone heads. When you get right down to Reality101 and the intermediate human future, this is actually worse than building giant stone heads, because stone heads don’t suffer, reproduce, or require further degradation of the ecology to provide for. In many real ways, the world and human species would be far better off if we immediately moved from GDP to “giant stone heads” as a metric for success (and say, doesn’t that imply to you that we might even do better than giant stone heads, if we put our minds to it?). GDP sets a money value on everything in the natural world and in human experience, and the most important things are currently valued at or near “zero.” Yet as we’ve seen, GDP is currently tied to the work of fossil slaves, who will be gradually flying away. There’s no way, even in principle, for “growth” such as we’ve recently seen to continue indefinitely, and considerable data points to it ending quite soon. GDP will begin a long decline because it’s tied to finite realities in the physical world. The good news, of course, is that GDP is an insane metric for success, just as “giant stone heads” was (though to give the Easter islanders their just due, at the time they had no evidence their belief was nuts, while in 2016 we have demonstrable proof that the conclusions of neoclassical economics are refuted by basic science). If we decide that we value happiness, quality of life, and a healthy planet with uncounted thousands of human generations left, we could in principle jettison GDP and do things differently. It won’t be easy, only necessary. It’ll be easier to fail than succeed, for the societal inertia of a raging amoeba hungry for growth is a hard thing to change. Nothing much depends upon it other than the human destiny and the fate of complex life on the planet. Learn to see the giant stone heads around you, and think about them. This article is reposted from INSURGE. So, the oscillations are probably mostly an artifact of the smoothing. 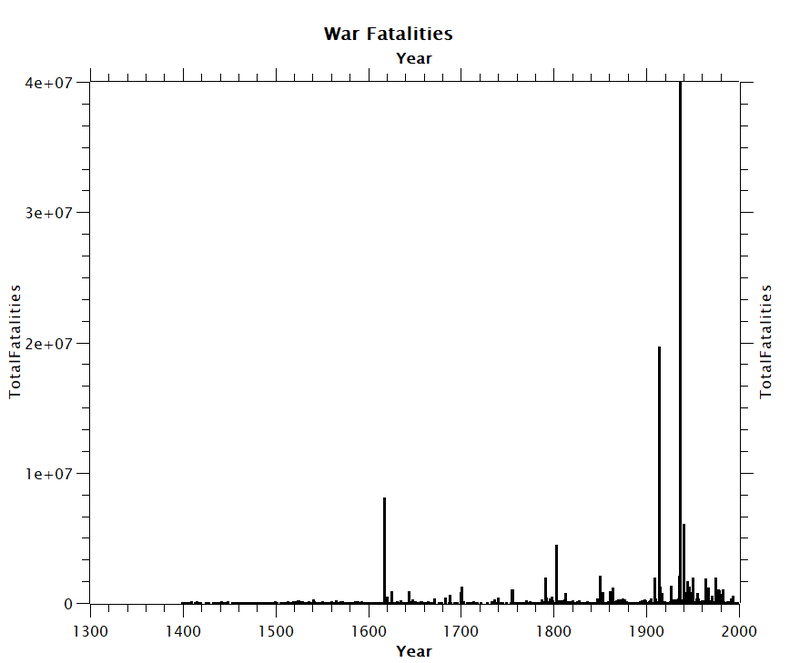 In reality, mass exterminations don’t seem to be cyclical. Rather, they seem to follow a “power law” — that is their probability is inversely proportional to their size (Roberts and Turcotte (1998) and Gonzalez-Val Rafael (2014)). 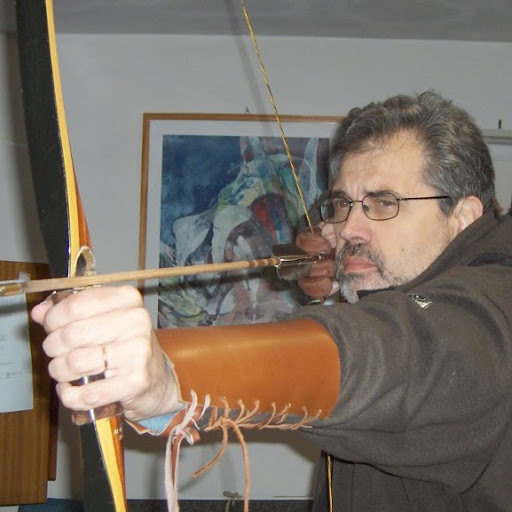 Ugo Bardi is Professor of Physical Chemistry at the University of Florence, Italy. His research interests encompass resource depletion, system dynamics modeling, climate science and renewable energy. 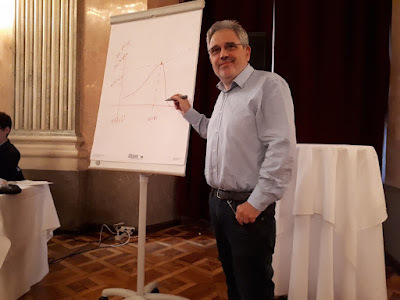 He is a member of the scientific committee of ASPO (Association for the Study of Peak Oil) and blogs in English on these topics at “Cassandra’s Legacy”. He is the author of the Club of Rome report, Extracted: How the Quest for Global Mining Wealth is Plundering the Planet (Chelsea Green, 2014) and The Limits to Growth Revisited (Springer, 2011), among many other scholarly publications. The Seneca Paradox: if mineral depletion is a problem, how is it that we don't see its effects? With oil prices remaining low and with production apparently more than sufficient to satisfy the demand, most people have jumped to the conclusion that all mineral resources are abundant and not a concern for the foreseeable future. Yet, the problem remains: mineral resources are not infinite. 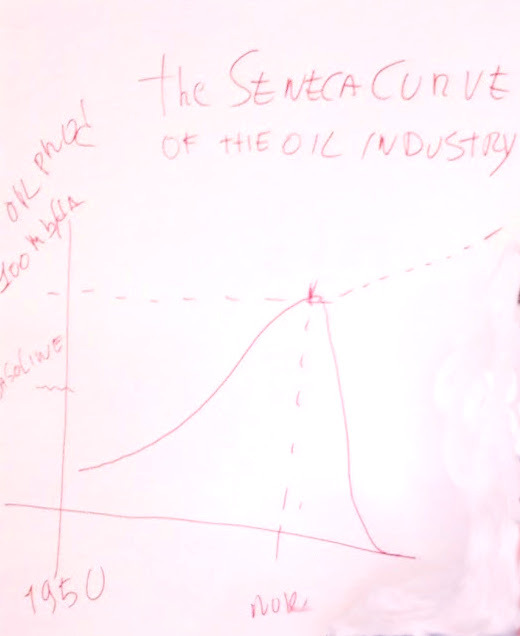 The solution to the conondrum may be in the "Seneca Effect." It is an insidious kind of effect that hides future risks behind an apparently safe and robust growth. The story of the Club of Rome starts with the issue of natural resources. In the 1960s, it had become clear to the Club's founder, Aurelio Peccei, that the world's resources were finite and to ask the question of how that was to affect humankind. 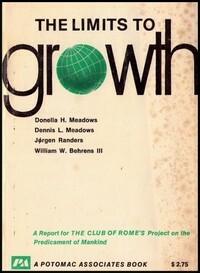 It was the origin of the first and the best-known report to the Club of Rome, "The Limits to Growth," published in 1972. The 1972 report already provided answers to the question of depletion. It turned out that resource scarcity would limit the growth of the world's economy and, eventually, lead it to decline. This conclusion was often misunderstood as meaning that humankind would soon "run out" of oil, gas, or some other resource; but that was never stated in the report and it never was the point. 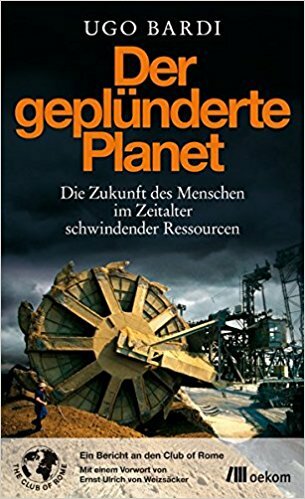 In 2014, the Club of Rome produced another report titled "Extracted" in English and "Der Geplunderte Planete" in German that reiterated the earlier conclusions. The author of the report, Ugo Bardi, a researcher at the University of Florence, Italy, concluded that the problem of mineral depletion was real and that it was progressively getting worse. Yet, these conclusions are far from being generally accepted. Depletion, it seems, is still considered a non-problem, especially in the extractive industry. "If depletion is really a problem," industry representatives often say, "how come that we are still producing mineral commodities at the highest rates ever seen in history? Besides, we observe that our production costs are not significantly increased when we use lower grade ores." So, is mineral depletion an existential threat to human civilization? 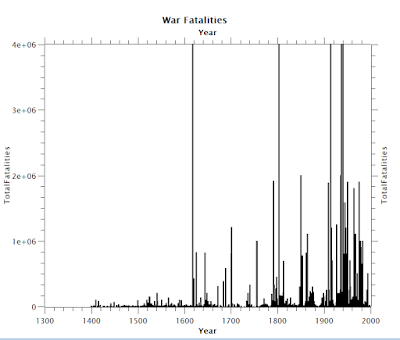 Or is it just a marginal problem that can be fixed by some technological improvements? This is truly a fundamental question for the future of humankind. An answer is provided by the latest report to the Club of Rome that was published in 2017, "The Seneca Effect." 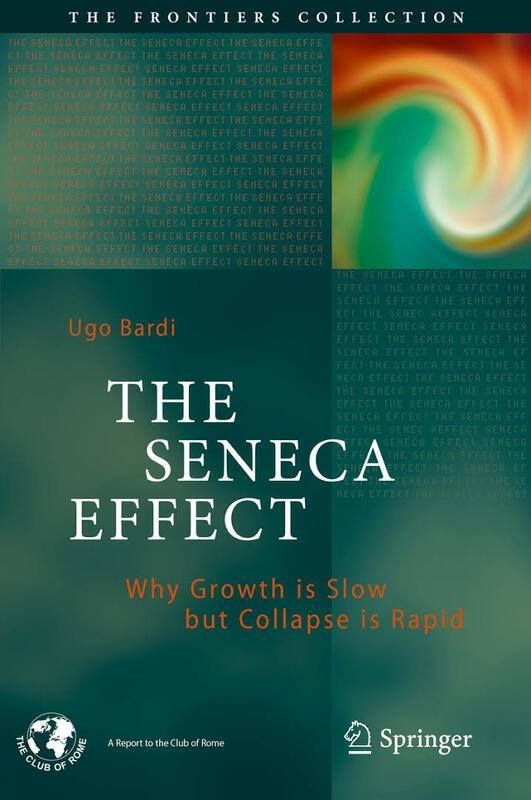 Taking inspiration from something that the ancient Roman philosopher Seneca said, the author of the study, Ugo Bardi, examines the trajectory of an economic system subjected to the dual strain of mineral depletion and pollution. 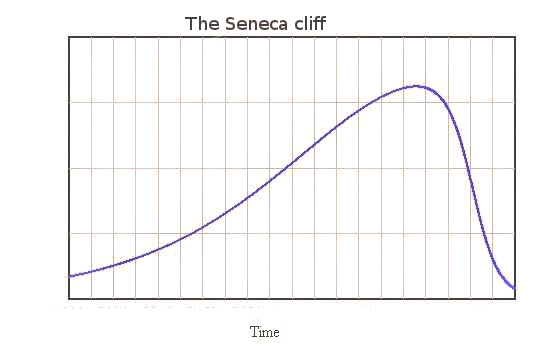 The result is the "Seneca Curve", a graphical depiction of Seneca's statement that "Increases are of sluggish growth, but the way to ruin is rapid." It is something well known in everyday life, but the study could confirm it using mathematical models. 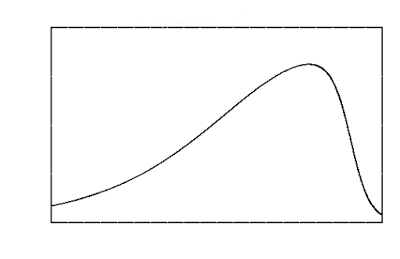 Here is the curve as calculated by simulations. The "Seneca Effect" or the "Seneca Paradox" explains why mineral depletion is a problem but, at present, we are not feeling its effects. We haven't yet reached the summit of the curve and we are not seeing the cliff awaiting us. So far, the extractive industry has been able to mask the effects of depletion by means of economies of scale. That has been possible as long as production keeps increasing, which has been the case up to now for most mineral commodities. The problem is that this strategy cannot last forever: mineral resources are not infinite. A good example of this effect can be found in the oil industry. At present, all fears of "running out" of oil seem to have been dispelled by the low market prices and by the still increasing production. Both factors give the impression of an abundance of cheap oil that could last for a long time - if not forever. 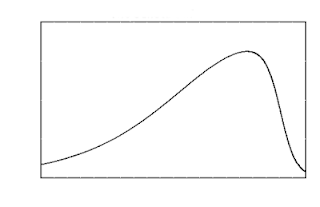 But this is exactly the result of the shape of the Seneca Curve. As long as we don't reach the start of the cliff, we don't see it. But ruin, as Seneca said, may be rapid. Consider the current climate situation and the urgent need of reducing carbon emissions. Consider the rapid switch to electric vehicles, often seen as a way to fighting climate change. Consider that in the US more than 60% of the market for crude oil product is for private vehicles. Then, you see that if people were to start replacing their old cars and trucks with electric ones (something that they should do by all means for the sake of our survival), the oil industry would lose a big bite of its market. For the oil industry, losing a significant fraction of their market is not just a question of downsizing; it is their death knell. 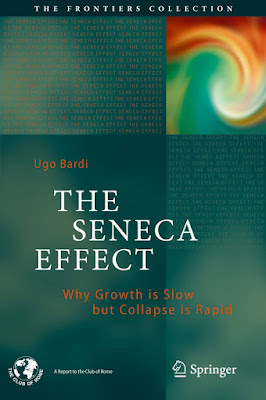 It is here that the "Seneca Effect" starts playing its role. The economies of scale which had allowed the industry to overcome the effects of depletion become diseconomies of scale, increasing costs and reducing profits. The industry becomes unable to attract new investments; it starts shrinking and eventually disappears: it is what Seneca said, "ruin is rapid". The decline of the oil industry has already been ongoing in several regions of the world and the loss of efficiency due to scaling down is well documented (see, e.g. Hall et al. 2014). In recent times, the US industry has been able to start a new cycle of oil extraction with "Shale oil" (more properly, "tight oil") but that simply means to postpone the unavoidable and the Seneca Cliff of shale oil may be just around the corner. Humankind is facing a difficult situation right now, with the twin threats of depletion and pollution working together to cause a decline that could be very rapid, as it is has been often the case for past civilization. 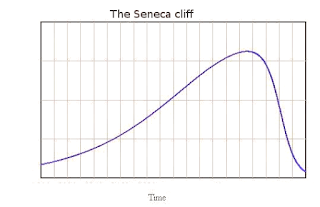 The "Seneca Effect" makes the situation all the more insidious because at present we have only a few hints of the future decline but when we will see the cliff in front of us it may be too late to avoid it in full. Yet, today we have powerful tools in the form of the science of complex systems. If we are willing to use them, these tools allow us to understand the future and to be prepared for it. If we understand the threats we face, they may be seen as opportunities. So, the impending ruin of the oil industry is not a threat but an opportunity to avoid, or at least mitigate, a future climate disaster. 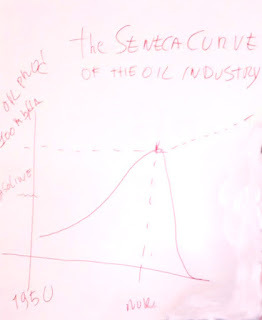 Once we understand this point, the strategy becomes clear: do not fight the unavoidable; do not try to keep the oil industry alive at all costs; that's exactly what makes the Seneca Cliff steeper. Instead, favor the unavoidable change. it means helping the oil industry to disappear by favoring its replacement by something less polluting and more sustainable. Similar strategies are possible for many polluting industries still common today. As always, the future is nothing but the choices we make and there is still time to make good choices. The Seneca cliff of the human civilization will happen only if we choose to make it happen. Several years ago, in 2003, I published my first book on crude oil (in Italian). 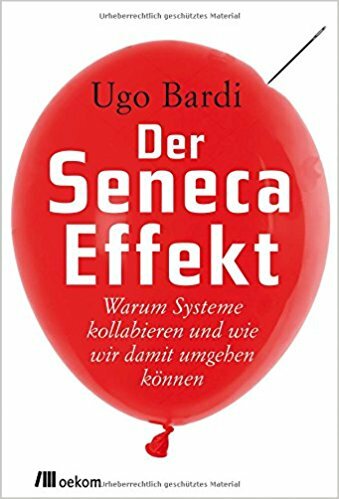 Not long after, I found on the Web that the president of a well known Italian organization of professional economists had written on their website that, "I bought Ugo Bardi's book and I found that it was written by an incompetent in order to cheat the public and make some money" (something like that, in Italian). What made me really angry about that was not so much being defined "incompetent" by an economist; that may be seen as an honor under some respects. It was that I knew that he had not bought my book. I had given a copy to him as a gift once that we had met during a public debate on an Italian TV channel. And now he whined about having spent money that he never spent. It truly made me see red. 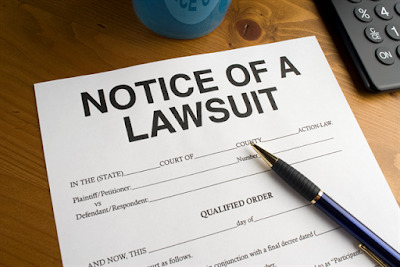 So, I went to see a lawyer and he told me that, yes, this was a clear case of slander and I had all the rights to sue the guy and ask for a compensation from him for having besmirched my good name of a professional. And that was what I did - I sued him. In life, everything you do is always an experience and this lawsuit was not an exception. It seemed to me crystal clear that I was right and he was wrong: apart from not even having paid for a copy of the book he was criticizing, his criticism was just gratuitous slander. Yet, I discovered with this lawsuit that whatever the law says can be interpreted in various ways and that's after all why lawyers exist. 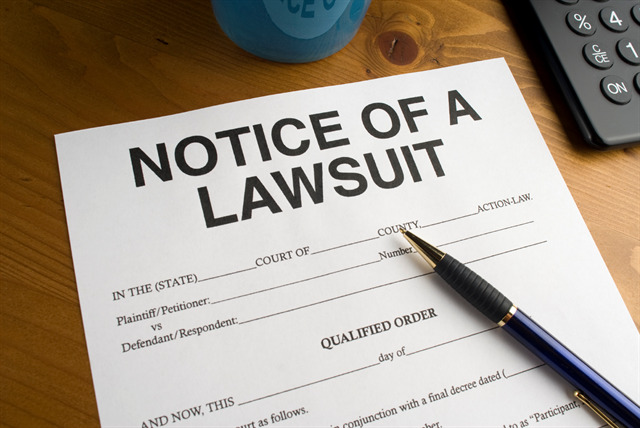 In theory, I had a strong case against my opponent but, in practice, I soon discovered that he had much more clout than me and that his lawyers could muddle the waters quite effectively. I'll spare you the various details of the story. The main point is that my opponent's lawyer endeavoured to demonstrate that his client was right in defining me an incompetent because that was what I was. How could he demonstrate that? Well, it was all about the TV interview when I had given a copy of my book to his client. Apparently, my incompetence had been so glaring on that occasion that everyone had noticed it. So, the lawyer requested a record of the interview and also asked everyone who had been present what had been said. Specifically, whether I had been able to answer the questions I had been asked. You may not believe that, but at some moment the lawsuit turned into a discussion about whether the day of the interview I could exactly quote how many barrels of oil were buried in some remote place of Central Asia. Since I had said that I didn't know that, it was clear proof that I knew nothing about crude oil and how was it that I had written a book on that subject? It could only have been a scam in order to cheat the public and make some money. For a scientist, it is unbelievable that decisions about someone's competence can be taken on the basis of such flimsy factors such as what someone said in a particular occasion, but it is what politics is about. It is the way the political debate works and if you are a scientist and you don't know that, well, tough luck for you. Eventually, this story exhausted everybody and we found an agreement in which my opponent agreed to pay for the legal expenses and a trifle more as compensation - an amount that didn't even remotely repay me for the time I had lost. And that was the end of it, fortunately. The second thing I learned is that you never, never, never sue someone unless there is some specific reason that goes well beyond revenge. It is a lot of lost time, it is expensive, there is a huge risk of losing plenty of money and even if you win, it won't be a big gain. Then, why in the world should you embark on such a silly enterprise? Think about the story I just told you: I had seriously risked being officially declared an incompetent by a tribunal! And not just that; you know that the press and the social media don't need proof to brand someone an incompetent. That Ugo Bardi was an incompetent could have gone viral and become part of the common knowledge about me. But the worst thing could have been for me of being accused of having tried to silence the people who didn't think like me because I was in it just for the money. Or maybe just because I was evil, or a subversive, or a terrorist. Fortunately, these events took place well before social media had become what they are nowadays. The fact that it was all in Italian also helped. The noise died out quietly and now this story is basically forgotten. Now, let's return to the present time and about Mark Jacobson having sued NAS and the authors of an article criticizing his work. Was it a good idea? Honestly, I think not. I have read some of the material related to the lawsuit: it seems to me that Jacobson may have some good reasons for suing but also that his case is far less clear-cut than it was for my case, when I had sued the economist I was telling you about. But the point is another one: it is clear that this story will go political. It is already going political as you can read here, here, and here. Jacobson is taking a lot of flak from an array of sources engaged in denying current climate science and disparaging renewable energy. He is being accused of trying to intimidate his opponents, of lying, of being intolerant of other people's opinions; the usual stuff. When the debate goes political, nearly everything becomes legitimate and we live in an age when everything can become the obvious truth when it is amplified by the social media. And so, independently of how the actual lawsuit will end for Jacobson, I think this story is not going to end well for science. (*) I have another example of the damage that comes when you say in public that you don't know something. It happened to me when I made the mistake of engaging in a discussion with a climate troll. He asked me a series of abstruse questions about the temperature of the atmosphere and I told him that he should have asked a specialist in atmospheric science. That led to a brief viral burst of messages on the Web stating, "Professor Bardi really doesn't understand much about climate science." It was all in Italian and, fortunately, it disappeared rapidly. I think it was General Heinz Guderian who said that when the morale of the soldiers is low, especially when they are in a defensive position, you give them something to do, for instance preparing an attack. And I think the situation in which we are requires something like that. It doesn't mean having people physically attacking someone, but taking an active role; doing something. 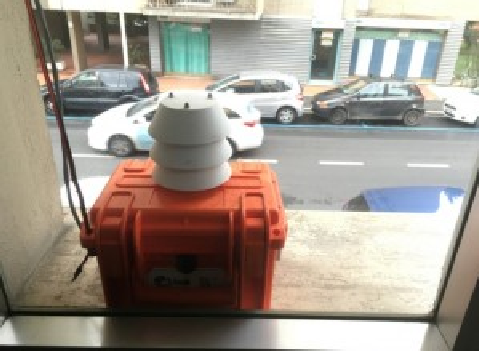 Here, Miguel Martinez reports about the installation a pollution measurement device in Florence, the Airquino, in a public garden managed by the Nidiaci Commons. The instrument is very simple and it provides data on various atmospheric pollutants. It is a way to take an active role in fighting pollution and keeping the commons alive and well. A good idea coming from Italy! On Wednesday November 8, technicians of the Institute of Biometeorology of Italy's National Research Council will come to the Nidiaci Commons in Florence's Oltrarno to install the first AIRQuino device in the district. This is a simple plastic box, with a sensor and a chip which can accurately detect all the main air quality parameters and updates the data every two minutes. This project, funded by the Regional Authority, aims at creating a dense network of small, very low cost monitoring stations, next to the official network of stations. The latter perform better, but are far more costly and there are only seven in all of Florence. The Nidiaci garden, right behind the Carmine church where Masaccio ushered in the Renaissance, is run as a Commons by the families of the Oltrarno district. Their Impatto Nidiaci project focuses on spreading awareness and improving the quality of life of the residents of this historic district. A district overrun by tourists and traffic, where an understaffed cooperative has to clean all the public parks according to an impossible schedule: when they do manage to come, everything from used nappies to electric batteries to the leaves from the trees is sent to the incinerator. In the last few months, the families have introduced separate waste collection, set up an educational garden, imposed a smoking ban in the garden, purchased solar lamps to provide more sustainable lighting, used the leaves from the trees – hitherto thrown away in the general waste as in all public gardens in Florence – as compost. The AIRQuino project will allow residents to become directly active in monitoring their own quality of life. To understand the operation of the AIRQino, Italian speakers can watch Italian speakers can watch this video.